During the Christmas season, many people look for unique paper to finish that perfect gift. this year, Calgarians will have the opportunity to get not only unique wrapping, but original works of art by some of Calgary's leading artists. The 2nd Story Gallery will present an exhibition of recent paintings by Calgary artist Geoffrey Hunter, from November 28th until December 14th 1985. The exhibition, titled “Capital Cities” is based on a symbolic social structure that is hidden within all the pieces. Each piece is an individual with its own set of rules and values that must fit within the whole structure of the city. Hunter sees painting as a method of obtaining everyday reality. Geoffrey Hunter is a graduate of the Alberta College of Art, where he majored in painting. During his time of study at the ACA, he received a scholarship to attend the Yale Summer School of Music and Art. He has had pieces in several group shows including the Yale Student Show. This third exhibition of work by the University of Calgary’s graduating students was made possible through the co-operation of the artists, the Fine Arts Department, and the Nickle Arts Museum of the University of Calgary. These representative pieces were selected by Gulf’s Art Committee from the show, which was recently on display at the Nickel Museum. 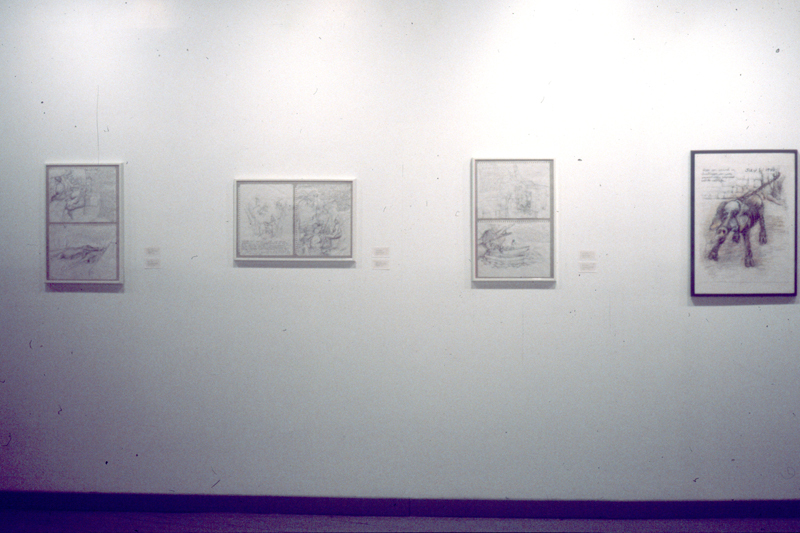 This exhibition of works by 1985 graduates of Alberta College of Art was organized to encourage those artists whose ambitions got them directly into the studio after leaving the institution. All the works presented here were completed since graduation. It is most interesting to see the changing of directions that some of these artists are taking as their intentions and work environments change. As we watch these artists through the following years, many more changes will come as they strive to contribute to the community in their own individual ways. 2nd Story Gallery is pleased to present an exhibition of recent works by Calgary artist Robert Arnst. This show, titled "Table of Contents", is an energetic collection of paintings and constructions. "Table of Contents" opens with a reception at 8:00 PM September 24th and continues until October 12th, 1985. Hours of exhibition are 12:00 noon until 5:30 daily, Monday to Saturday. This exhibition is comprised of work done since graduation from the alberta College of Art (april 1985). The way I paint gradually develops while the subject matter remains relatively consistent. Scale, excepting the small constructions, has changed little over the past three years. A visual language for representing people in their surroundings or situations is inherent in the work. I strictly adhere to both the subject in a painting and the painting as an object. By doing so, a communicative object is resultant. This concern with object making leads me to concentrate on surface more than depth or spacial representation. The large paintings are concerned with worldly or sociological situations and incorporate universal symbols. The small constructions deal with life, through symbolic representation, on a more personal, private level. the small and large pieces juxtaposed provide an overall picture of life in a changing world where each person must deal with reality on a private and public level. This exhibition exceeds any of my previous work in content and execution. It has provided me experience to grow towards maturity as an artist. The exhibition hopefully provides the viewer with an optimism for the future and a chance to expand personal horizons. Special Thanks to Jim Goertz, Larry Semchuk, Mr. & Mrs. L. & J. Arnst, Tim Bester and Jody Corner. Robert Arnst was born in Saskatchewan and moved to Calgary "just before reaching puberty". He enrolled at Alberta College of Art in 1979 and graduated with a major in painting in 1985. "Table of Contents" is Robert's first show since graduation. 2nd Story Gallery is pleased to present an exhibition of work by Calgary artist David Jenzen. The exhibition, titled "Paintings/Constructions" span a two year period from 1983 - 1985 and reflect a shift from "straight" painting to a more "hammer oriented" approach: odd tensions arise from the difference between life painting and a constructive ethic. Common objects find themselves fastened to wall shrapnel and small appliances hit galvanized tin. These are journals of cabin fever: pictures of time spent here. I've done a bit of jumping around. I came out of art college with an intense interest in direct perceptual "life" painting. 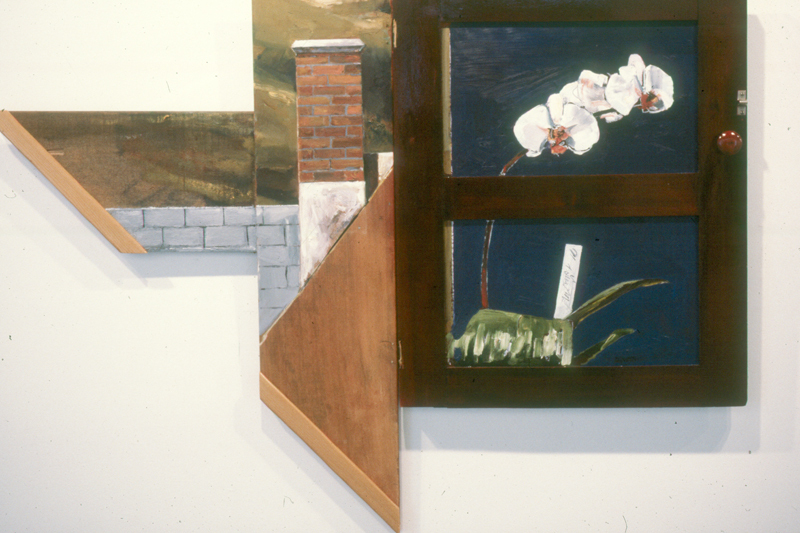 Prior to that I had developed a lust for photo derived, collaged imagery as well as a curious attraction to almost completely non-objective "built" paintings which generally defied a conservative format. With this body of work, I began making an empirical, controlled sort of painting and later reacquainted myself with less traditional avenues. This has led to a "tow-headed" stance toward more or less flat pictures as is spawning many hybrids in which almost anything goes. "found" imagery dominates many of these works. At times, I see a real object as being more to the point and direct than its painted facsimile. To simply attach a thing to a support, when warranted, makes sense. Even moving away from easel painting seems, in my case, to have much to do with easel painting in that the subject is still presented naturally. Clarity and spatial articulation are at odds with format (or the lack thereof) and the results can be surprising and fun. These paintings are accountable in terms of describing locale; nothing here to deny that they were made in a Northwest Calgary basement; close to home, content-wise. I'm delighted by hidden qualities in common, household items; the banal becomes sinister, humorous, or personified. The river becomes a reductive metaphor. Casual observation or close scrutiny of the poetry and grace of everyday things offers rewards and entrenches happiness. David Jensen graduated from the Alberta College of Art in 1983. he grouped up with Derek Ennett and Jack Niven at the Pheonix Gallery in Vancouver last November for "Juggernaut Tableau", taking a "roundhouse swing at tradition" while gathering solid response during 1984's Art City. A collective retrospective funded in part by CRAF. This exhibition marks the end of not only the programming season, but the infancy stage of 2nd Story's development. It is reassuring to see that the artists represented here, half of whom had their first exhibition at 2nd Story, have been maturing with us. This is quite evident when one looks in retrospect at the exhibitions each individual contributed to in the past, compared to this collection. While this show does not indluce everyone from the fifty plus exhibitors during the last two years, it does represent a fairly broad range of the philosophical and stylistic bases that have been shown here. As the 2nd Story Gallery moves into the third year, some changes will be evident. We hope that these changes will benefit and encourage the artists as they continue to develop and enrich our community. An exhibition of works on Canvas and Paper by Fred Maclean and Fae Rattray. Fred Maclean was born in Ontario and moved to Alberta as a young adult. He attended the Alberta College of Art from 1979 to 1983, graduating with a major in painting. Mary Fae Rattray is a native Calgarian, and a multi-disciplined artist. She has studied dance since her childhood. In 1972, Rattray studied commercial art through Minneapolis Minnesota Art Instructional School, and from 1974-1977 she studied painting at the Alberta College of Art in Calgary. In 1984, Rattray completed her BFA at the University of Calgary, with a major in Drama and Dance.